Being a mailman is not the easiest job in the world. But usually when dealing with animal attacks, they are usually keeping their eyes out for dogs. 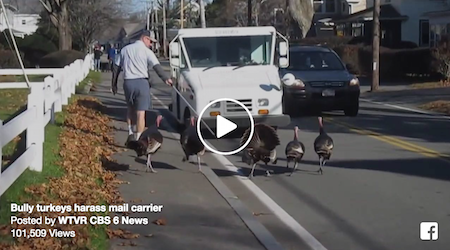 But for this mailman, his worry is not dogs, but turkeys. Every day, he is chased and bullied by 5 gobbling turkeys. For some reason, these turkeys are very upset with him! You can check out his daily routine in the video below. Bully turkeys harass mail carrierAnd you thought your job was tough. In addition to making sure Christmas cards arrive on time, this Massachusetts mail carrier must also deal with a rafter of bully turkeys. Why do you think they’re so upset?